Vertical forests, vertical farming, and vertical high-rise wood constructions: the denser our cities become, the greater the need to address the lack of space available for plants and trees, and to think about innovative ways of integrating natural systems into our urban spaces – where the sky is the only limit. 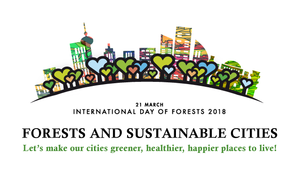 This years celebration of the International Day of Forests, with a special focus on Forests and Sustainable Cities was a joint effort of the UNECE/FAO Forestry and Timber Section, the UNECE Housing and Land Management Unit and the FAO Liaison Office in Geneva. Together, they organized a series of short lectures, which showcased unique ways in which forests have gone 'vertical'. The event gathered eminent speakers presenting innovative ideas on urban farming, wood construction and architecture, showing that technology and ingenuity have no limits. H.E Ambassador Foo Kok Jwee of Singapore, presented on the importance of vertical urban farming for food security in cities with high population densities. University of Cambridge academic and director of the Centre for Natural Material Innovation, Dr. Michael Ramage, explained innovative advances in wood construction, which could lead to future skyscrapers built entirely of timber. In his presentation on "Supertall Timber", he stressed that while this can significantly reduce the building's carbon footprint, in order to be fully sustainable, the timber needs to come from sustainably certified forests. From the design perspective, Arch. Maria Chiara Pastore of Stefano Boeri Architetti shared the vision of Stefano Boeri, creator of Milan's emblematic 'Vertical Forest', an architectural design which integrates trees within building structures, thereby increasing tree cover in cities. Please find our news release on the occasion of the International Day of Forests and pictures from the event, as well as the programme here.